Sure, President Barack Obama is driven around Washington in a modified Cadillac known as The Beast -- but hey, that doesn't mean he's not interested in vehicles lacking Kevlar-reinforced tires. Rumors were swirling earlier Tuesday that he would pop up Washington Auto Show, and he didn't disappoint. The president entered the Convention Center around 2:30 p.m. According to the Associated Press, he's doing so to bring attention to his decision to rescue General Motors and Chrysler three years ago -- and to draw contrasts with GOP opponent Mitt Romney. 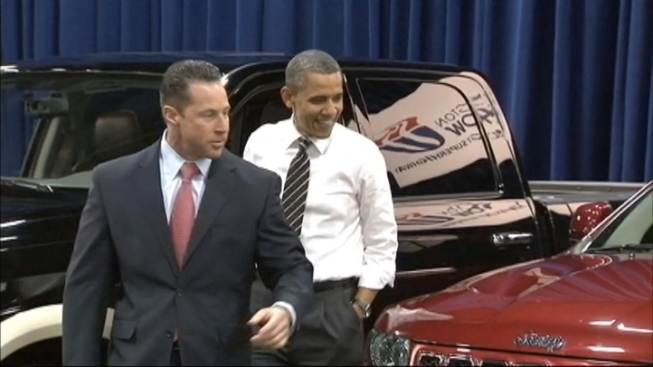 Obama says the U.S. auto industry is back, and GM's success shows what's possible for American manufacturing. In a shot at Romney, who opposed the bailouts, the president said: "It's good to remember the fact that there were some folks who were willing to let this industry die. Because of folks coming together, we are now back in a place where we can compete with any car company in the world. And these are not only selling here in the United States, they also serve as a platform for us to sell product all around the world." President Obama's spare limo gets stuck while leaving the U.S. Embassy in Dublin. While at the Auto Show, Obama walked down the "advanced technology superhighway," checking out advanced models of Ford, Chrysler, and GM cars. One Ford hybrid boasts 47 mpg. A plug-in model travels 20 miles on a charge (results may vary). Obama also checked out a black Chevrolet Corvette he said was just like one a friend had in high school.